We met her in Beirut, on her return from Egypt where her voice touched the heart of crowds to the top of the pyramids. With the same gentleness, the same determination, Magida El Roumi defends her colors, the color of life, the love she sings, love, the love of others, as a committed never changing artist. For the Lebanese Cooperative for Development, she will sing on October 26 in St. George Maronite Cathedral. Who discovered your talent? My parents discovered firstly that I had a beautiful voice. I just remember, that as a kid, I sang for the family. Then one day, I attended a program on TV, like that for fun. The fate would have it become a path, a journey, a life. Your father is called Halim el Roumi, has this played a role in your celebrity? This was a great chance but not in the way you think. I lived my childhood in an artistic family. It helped me later not to lose my way. If I had to do it again, I would follow the same course. You come from Egypt and Jordan, where each of your concerts was a great success. How would you describe your experience of Arab countries? I have already sung 4 times in Jerash. The Jordanian public and me, we’re used to each other. 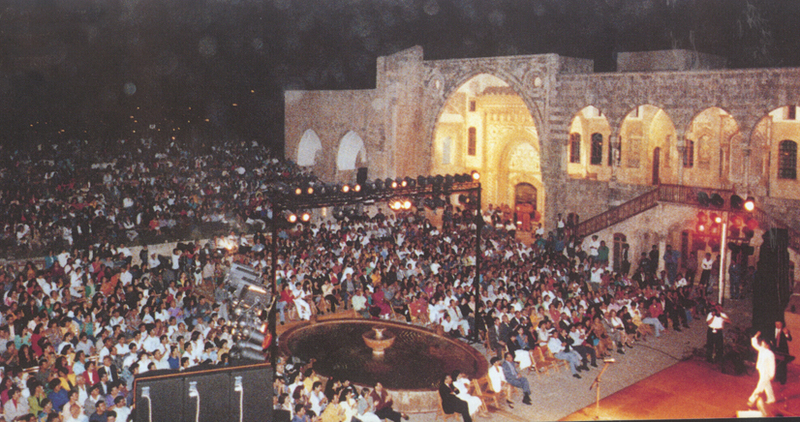 It is true that before going on stage, there is anxiety, stage fright, but much less in Jerash. As for Egypt, it is the first time I go there. I panicked at the directory selection. But the Egyptians have given me a very touching and respectful welcome. For me it was a great joy to discover that there was still an Arab audience that appreciates the melodic poems, not just those songs for dancing. What is the spectacle hall that is close to your heart? All of them, whether in Lebanon or abroad. Each one is unforgettable and holds special memories, but some stops were key moments of my career as Jerash, Carthage, the convention center and the Olympia in Paris. Qasr el Mou’tamarat in Egypt. During your travels, you take the time to know the country, its culture, its cuisine? Not always, only if I have time, especially before and after concerts, because there are interviews and meetings with the public. In your job, what do you like, what do you dislike? This is a wonderful profession. Especially when composing on the piano … a beautiful moment, but there is in consideration fatigue, anxiety. It’s hard when we constantly prepare our suitcases, when burning to find the word you need, a rhythm that appeals especially to young people. Stress, it never ends, we are relieved at the end of a concert, but it is only a truce. Who do you listen to from the new generation of singers? Have they brought something new? Michael Jackson. Because he offers impeccable contents, his clips simply dazzle. Are you affected by disasters in the world or do you live in another world? They hurt me deeply. Is that Man will learn one day to respect the life that is in him or in the others? As long as there is society, there will always be jealousy, the need to destroy. The ultimate crime against humanity is abuse suffered by the children in the world. What are your current projects, CD, maybe a movie? On October 1st, a CD, a concert at the UNICEF benefit on September 26 and on October 5th, a concert at the Palais des Congrès in Paris. These are my closest projects. In winter, I will give a series of concerts, once the new CD will be on the market. Has any of your daughters a beautiful voice? Noura but it is too early to judge. How do you balance between the entertainment world and home? We got accustomed to it. We had two children, and music also grew, evolved, in our home. These are two things inseparable from each other. I love my family and I do not find it difficult to share myself between my job and my home. I sacrifice neither one on the expense of the other. In the morning I work my voice and my songs. My children got used to that, as in the appointments of any active mother. In the afternoon, invariably, I stay with them. In the evening, we are free, Antoine and me. What is your favorite song? Your favorite composer? I appreciate them all, each of them gave me something, added something to what I had. And I best expressed myself through my patriotic songs. What Lebanon to sing? I always feel very concerned about this issue. Nothing touches you more than the truth. My patriotic songs are, as a whole, the closest to my heart. In short, all the composers with whom I worked made me evolve. Interview by AMIN ABI YAGHI.